My new machine arrived nicely packaged. No complaints about missing parts or damage. Was actually not too heavy to move into the basement with the help of two friends. Assembly took a little while – the harder part being aligning and tightening the belt. In fact, I think my belt is still too loose, as at start-up and shut-down the machine makes a bit more noise than I’ve read others with the same machine were able to achieve. Fit and finish on the machine is adequate- on the parts that matter the surfaces are level and came factory set just perfectly. The other surfaces however are a bit rough. I had to take a bit of sandpaper to the bed edges as they were rough enough to cut skin. The surface left by the cutter head thus far (on quarter sawn white oak) is comparable to that of my hand planes. I’m pretty happy with the upgrade on the cutter head – especially since blade changes are going to be much easier than on my old straight-knife machine. My only issues thus far with the machine is that the on/off button is mounted to a post which is bolted onto the indeed bed. This post is a bit flexy, and I wouldn’t be surprised if it breaks in the near future. One other issue (and perhaps I just need to fiddle with it a bit) is that the blade guard does not want to return to the closed position by itself after it is opened. Also, the cord that comes with the machine is way too short. It would be nice if they supped a cord of suitable length for most shops. Overall I’m pretty happy with my purchase. The beds are flat, the fence is straight (unlike my old 6” Jet), and the finish is superb. I’m giving the machine 4 stars out of 5. I have no photo of my machine (look online – mine looks just like the rest), and Lumberjocks requires a photo to post a review – thus my ugly mug-shot. Enjoy! Grizzly is not famous for there electrical cords. In the same light the cords are not very long on many machines and I think they all should be heaver. I go to a box store or a Electric Supply house and buy the next size heaver wire cord than the machine calls for and a plug so I can plug the cord directly into a receptacle. I then feel safe, knowing that I have sufficient wiring to keep from overheating the wire or the motor. The post is a very good location for the switch. Maybe you will have to reinforce it. I know you will enjoy the cutter heads. They are sweet. I can’t think of a machine I own that came with a long enough cord, I hardwire most of my machines into a disconnect box and like Bigrock I add my own cord, usually larger gauge as well as better quality. I have bandsaws that cost 5 times what that jointer does and they only came with what would be called a pigtail. Often the noise is the belt having taken a set, if it doesn’t smooth out and it bothers you, change the belt (call Grizzly they will probably send you a new one). That really is a best buy in a new jointer. the gard not returning just may be that the spring may need another rap if is the way mine was. I bought the same machine in January. I also struggled with aligning the motor pulley with the fixed pulley on cutters. When I turned on the machine it was rough and when I tried jointing a board the ribbed belt would come off the pulley a bit and ride in another rib. The problem is there is no room to put a straight edge between the two pulleys due to the small opening between the two on the cabinet. To solve this I placed a 1” aluminum angle piece clamped to the top pulley and used that to align the bottom one. To get the belt as tight as the manual suggests I used some clamps to push the motor mounts away from the housing. I think the problem is the low quality ribbed belts. I called Grizzly and they sent me replacement belt that was supposed to be better quality, but they were the same from the same manufacture. The machine gets smoother as it runs and the belt wears in. Now with everything aligned tightened and broken in the results are great. Glad I bought the machine. Grizzly could improve things by including something to align the pulleys and a more rigid and adjustable motor mounting. I got a Grizzly 6” jointer a few weeks ago and had the same problem with the belt. It was pretty tough to keep tension on it while tightening the bolts. After I tightened it the first time, I ran it, and the belt started smacking the side of the belt guard (the belt must have stretched a bit) so I had to do the same thing all over again. All in all, though, I’m happy with mine. -- Tyler- Montandon, PA ------ "It aint broke, it just needs fixed!" Rab; great advice on aligning those pulleys. I’ll give it a try. How did you properly tension the belt? I was able to get a bit more tension by using a spreader clamp, but it was difficult due to the slope of the dust chute, and the tension is still not to the specification described in the manual that came with the machine. Man, you’ve been on a tear with these new machines! I’ve noticed the same thing about the machines with switches mounted on posts. I usually switch out my switches with big paddles. I bought a few that didn’t match my amperage and had to buy others. Lesson learned. I want to say I picked up the big 220V from Grizzly or Amazon for less than $40. Not the end of the world, I guess. I’ve got serious machine envy about this one. 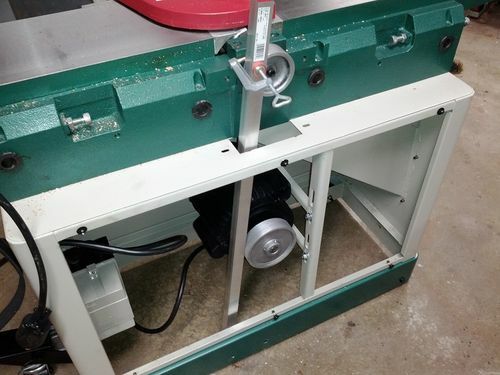 in a spreader mode but only on the pulley side and was able to fit it along side of the dust chute between the cabinet top and the upper motor mount. I think the ribbed belt belt requires better alignment and tension than a v-belt and the current motor mounting scheme makes for difficult adjustments. I’ve actually had the PM2000 for nearly a year now. What’s with the mean people over on that review? Gotta say it again, I’m pretty happy with the grizzly jointer overall. Great value. Rab; Those are the same clamps I used. Next time I’m inside the jointer cabinet I’ll give them a try again now that I know it is possible to get better tension. I have had the 490 for about 7 years now. Non spiral head. Love it. Would love it more if the head were spiral…..but I got my planer for that. My machine, like yours makes lots of noise from the belt as it comes to a stop from being on. There is nothing that is going to fix this…I have tried. Overall though…it is just a noise and has never ever effected the performance of my cut. The belt is always going to have memory in it no matter what. This is what cause the issue. I tried replacing that belt with a link belt. It would not fit due to clearance of the top pulley if i remember correctly. So back on went the factory belt. My advice is to not beat yourself up over the tension on this belt. Mine is actually what you might consider “loose”....but it is not coming off. This has provided the best performance and the original belt is years from needing replacement. BTW, I ditched the factory cord and replaced with a piece 15’ long of 12/3 I made from an extension cord. Enjoy your machine. It will work hard for you.